Just My Style: Cosmic Rainbows! 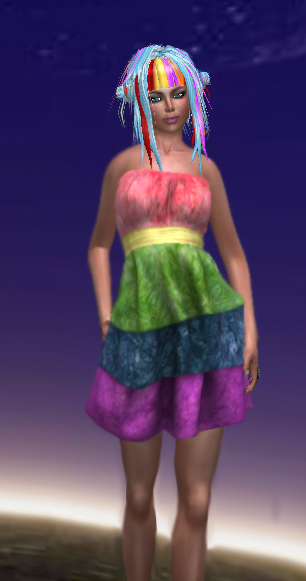 The dress is the Ruffled Dress in Rainbow - a prize from Pixel Snob for the Taste of Second Life 2nd anniversary hunt. It's a mesh dress, and in the package, you get sizes XXS, XS, S, M, and L. It also comes with a flower attachment, in 6 different colours. As you can see, I didn't attach the flower and it looks good with or without! And of course, it was free, free, FREE! This hair - I LOVE IT! The style is so cute and bonus of course that it has rainbow streaks! And the shine on it is lush, it's a really nice hair! I think this will be one I shall be seen wearing a lot around SL! It is the *BC322 Rainbow cotton blue. I picked mine up from Second Life Marketplace, but you can get it in-world too at Skull&Bones as far as I know. See links at bottom of this post to get the SLurl! And the best thing about it!? It cost me just 1$L! !